Bret Hart has seen the future of wrestling, and he is the man wearing the WWE championship. “Seth Rollins is one of the hardest working wrestlers I’ve ever seen,” said Hart. “He’s one of those rare guys in the industry today who is an innovator and a guy who creates new ideas, moves, and psychology. Midway through the calendar year and three months past WrestleMania 31, the “Hitman” delivered his “State of the WWE” address exclusively to Sports Illustrated. “Daniel Bryan is finished,” said Hart. “He’ll never wrestle again. I don’t think he knows it yet. I feel terrible about Daniel Bryan. For all intents and purposes, he had the exact same thing happen to him that happened to me after Bill Goldberg kicked me in the head [ending Hart’s career]. Bryan’s attempted comeback included many of the same dangerous maneuvers that were part of his repertoire before the neck injury. Bryan’s absence is a major void. Despite the tumultuous stretch he endured this past year, Hart believes Roman Reigns will still be a future WWE champion. The biggest issue was that his push was artificially manufactured. “It was so manufactured that it hurt someone who was naturally getting over on his own,” said Hart. “As soon as the company decided they were going to make him the star, people started to sour on him. Roman Reigns is a really good wrestler and he’ll find his path. He turned the corner at WrestleMania when the fans accepted him on his own merit just ‘cause he had a great match. Hart understood that the WWE was in a difficult predicament heading into WrestleMania 31. Reigns became so disliked that even Dwayne “The Rock” Johnson was booed by the live crowd in Philadelphia at the Royal Rumble simply by his association with him. 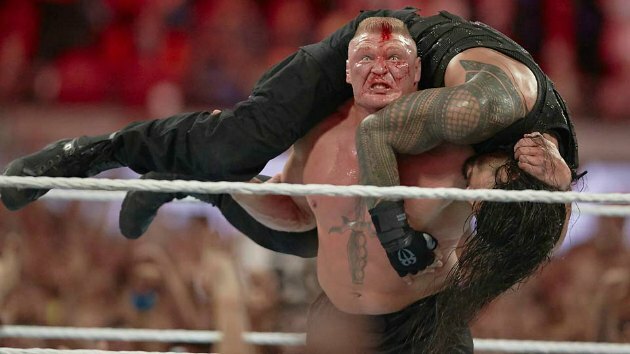 In spite of the bumps along the way, the “Excellence of Execution” was extremely impressed with the way WrestleMania 31 was booked and executed. Hart’s devotion to wrestling is still evident the moment the 57-year-old speaks. While he is sometimes critical of booking decisions or in-ring work, his heart still beats for the business. “I know Seth Rollins is a CrossFit guy,” said Hart. “I just think back to my days, and I don’t how I could have done CrossFit training and then wrestled that night. I tip my hat to a lot of the young wrestlers, there are a lot of great ones out there. Hart immediately bonded with Cody's brother Dustin [Rhodes] Runnels when the two worked for WWE in 1990. Runnels, who is currently recovering from shoulder surgery, ultimately returned to the WWE with a vengeance, sporting a blonde wig and kept viewers constantly on their toes as Goldust. Count Hart among those who believed that the Rhodes’ brothers were destined to settle their feud at WrestleMania 31. “It would have made much more sense to let them have their moment,” Hart said. “It’s not very often you can build into a storyline that for real. Cody and Dustin are great workers and could have done the same thing Owen and I did [at WrestleMania X]. They’ve probably wrestled with each other their whole lives, and thinking about wrestling concepts and ideas, so to have that storyline yet not give them the big stage is a big question mark. Brock Lesnar just returned to Raw this past week, and Hart sees wrestling starting to move in a different direction with the “Beast Incarnate” leading the way. “You won’t see a smaller guy – under 200 pounds – be a main event in WWE for a long time,” Hart explained. “I think you’re looking at guys like Daniel Bryan and CM Punk phased out. After Hulk Hogan, the business took a different direction. Wrestling became the forefront of the business from me to Shawn and all the way to Punk and Bryan. It was all about the matches and the work rate. Another topic of concern for Hart – a former two-time tag team champion – is the state of tag team wrestling. “For so long, I don’t know why WWE killed everyone off that started to get built as a team. It was the same thing when Cesaro and Tyson Kidd [as tag team champions] lost in that handicap match to Randy Orton on Raw. Vince has soured on tag team wrestling. He says it’s the same old thing over and over. Hart remains close with Tyson Kidd, who injured his neck during a frightening moment in a non-televised match with new WWE talent Samoa Joe. Kidd was injured when Joe performed his “Muscle Buster” maneuver. In terms of accountability, Hart recalled the incident between Steve Austin and Owen Hart at SummerSlam 1997. Hart also provided some perspective as to why Sting lost in his WWE debut at WrestleMania. The opportunity for Paul Levesque to learn from Vince McMahon, Hart explained, will keep the WWE running in the right direction for a long time. When it came to Owen Hart’s notorious pranks and hijinks, Hart thinks one of the finest came against none other than Vince McMahon. “Henry Godwin had a match with Triple H at an In Your House pay per view in the 90’s, and it was a pigpen-type match with a bunch of animals,” he said. “Some guy pulled up earlier in the day in a livestock truck with pigs and sheep and goats. He pulled in and asked, ‘Where do I put them?’ Owen was right nearby and said to follow him, like he was helping the guy out and knew exactly where to go. Hart knows exactly what he needs to be changed to make WWE’s wrestling an even better product. “It’s the details,” Hart said. “There is too much attention on rehearsed high spots. It’s a lot of action, but I don’t see any storytelling. And the babyfaces don’t sell any more. I can remember crawling and begging, or getting thrown into the turnbuckle frontwards and everyone in the building wondered if you’d get up again. People understand that. The lack of emphasis on finishing holds also grinds Hart’s wrestling sensibilities. “Wrestlers always have to go higher,” he explained. “John Cena was using the stunner as a spot, and [Steve] Austin got mad about that. I would have, too. Why would you use his finishing move as just a spot? If you keep having all these complex moves and high spots, then you need to top it and keep going higher and higher. And then you’ve got to come up with something that’s really dangerous, like a spike piledriver off the top turnbuckle. Hart, who has spent his entire life in wrestling, was broken up over the loss of longtime friend Dusty Rhodes. The friendship between Hart and Rhodes dated back over 30 years. Dusty Rhodes and Hulk Hogan were both stars in the 1980’s, and Hart was asked which direction the business would have headed had Vince McMahon chose to put his marketing machine between Rhodes in 1984 instead of Hogan. Hart takes a lot of pride when his fans call him, “The best there is, the best there was, and the best there ever will be.” But he’s just as proud to say wrestling fans are the most dedicated in the world. “I had someone thank me last week,” said Hart. “He said I stopped and shook every hand on the way back from my match, and this happened more than twenty years ago. He said he never forgot it. The fans have long memories, but I never forget them either.